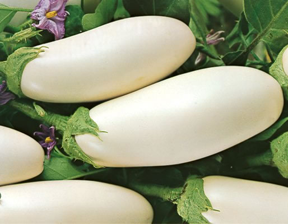 White eggplants have delicate flavor and sweet skin. 'Iceberg" has even more flavor, very creamy and mild. Compact robust plants stand 45-60cm loaded with slender, 16-20cm long 5-7cm across pear shaped 1700-250g fruits. Perfect to grow in containers and patios. Delicious! Sow January to April for growing under glass, March to April for planting outdoors, in pots of moist seed compost and cover with a 6mm layer of compost or vermiculite. Place in a propagator or warm place, and keep at a constant temperature of between 20-25C. After sowing, do not exclude light as this helps germination. Keep the surface of the compost moist but not waterlogged; germination will usually take 10-14 days.